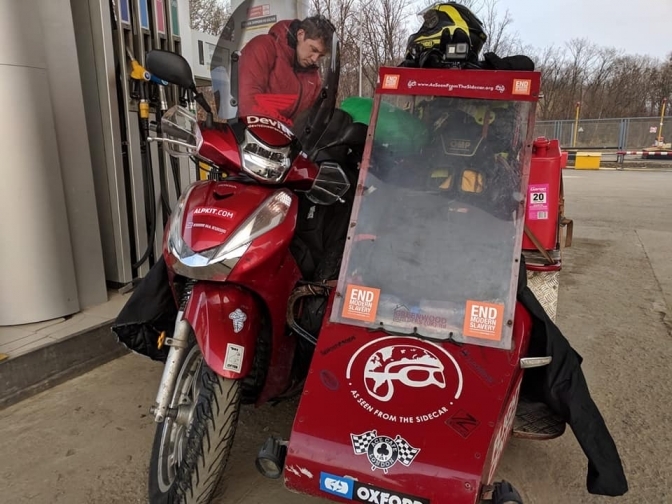 If you have been following the As-Seen-From-The-Sidecar adventures over the past twelve months. On Facebook you will know what this story is about. But there will be some of you who are new to the story, so here for you first is a bit of History of how the plot started and what the lads (now men) have been up to. Over a coffee one wet day they came up with a plan to try this adventure stuff for themselves. So bought a couple of Yamaha 125’s stuck on the L plates and rode down to Lands End from London in a very damp and cold winters morning, and spent the next ten days doing the Lands-end to John O'Groats run.. In appalling weather. Even a trip to A and E was put in.. So fired up by this epic journey, they needed to fuel this adventure itch, so needed a excuse to do something that know one had done before, and over another coffee on another wet day in London looked at every stupid idea they could come up with, and the most stupid was to circumnavigate the World on a scooter, but better still one pulling a sidecar…….No….. So eventually I got to speak to the two lads Matt and Reece, and got involved with the plot, although I did say they were crazy even thinking about it, but there was no swaying them, that is what they intended to do, and for the cause to expose Modern Day Slavery, and to fit in a Guinness world record or two. I could see that they were not going to change their minds, so thought I better try and get them the most sensible option of a chariot that would try to fit the crazy bill. I spent weeks looking to find the most appropriate scooter to do the job, and a super scooter was not an option. And we kept coming back to the only one that was near fitting the bill and that was the Honda SH300I. The lads went to look at one and agreed that this looked right and had the biggest wheel option available. I sent the lads to see two I had found quite local to us and one was leaving the country to live in the Alps, and the other in Gloustershire was not keen on the time deadline, and the price they had quoted put it out of range of the lads funding. The wheels had been set in motion for a start on this ridicules trip from the Ace Café in October 2017, and it was now the end of July that year and not a glimmer of getting a sidecar built, another manufacturer had been looked at, but then cast aside on closer inspection. 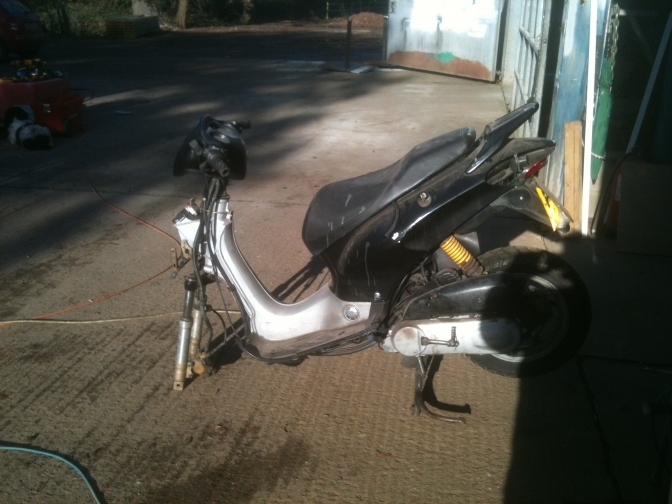 The lads called into the yard on the last Saturday of the month in near desperation as they had managed to fund the scooter and it was now ordered for collection, so there was no turning back there had been too much spent and organised, to even think of knocking the idea on the head. 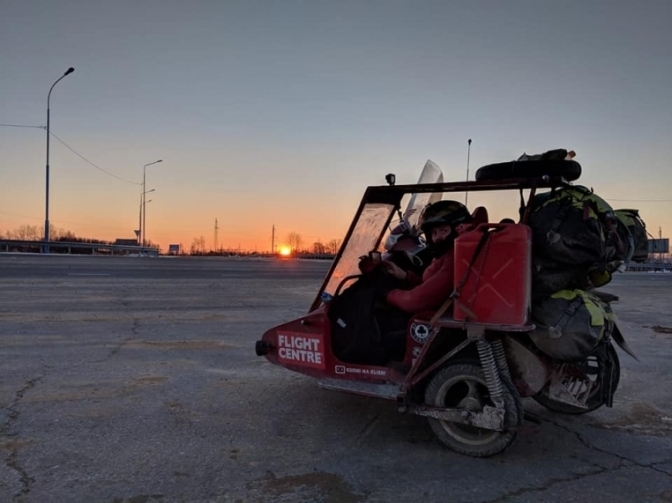 I said I would help all I could if they could somehow find someone to build the basic frame for a sidecar, as I did not think we had time, although we had built the ambulance sidecar in a week for the TSB conference deadline at the beginning of the year. The lad’s heads hung low as they could see that it was now probably a big mistake to have set a start date, that looked out of the question now. Into the yard pulled my brother on his return from London, I told him the plight of the lads has he met them? “ Get the bloody scooter bought” he said and bring it over we will build a sidecar it can't be that difficult, Charlie will design one up for you”. (We actually designed it on the hoof so to speak) and I had to rejig the sidecar swinging arm and wing more to my satisfaction later and this then had to be bolt on as welding on the bike we thought a No-No. at the time). sidecar challenge FB1_Medium (1) from Malcolm on Vimeo. 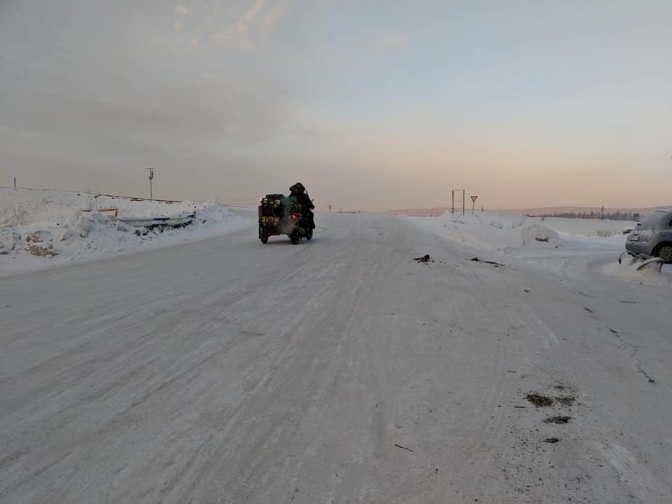 Round the world on a scooter and sidecar Part 1 from Malcolm Kew on Vimeo. More photos of build later...and continuation of story. I also suggested that as this machine was a lot like a rally car, and needed that same sort of design, we should fit a rally type seat and harness to the sidecar,so we did, and I ordered an OMP seat from a company I had dealt with before, Ironically the seat and scooter were both designed and built in Italy, so this was a good connection I thought. My brother had decided that the plot needed stronger rear shocks fitting to the scooter to aid better steering, and I had said from the outset, that the scooter needed fitting with leading link forks to aid better steering, but time ran out and the scooter only returned one dark evening ,at the yard to have the pair of Hagon shocks that they had generously donated to be fitted. 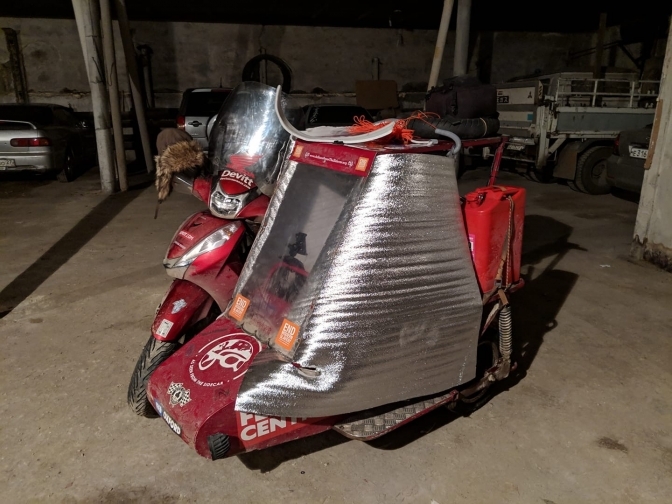 The sidecar shocks that were meant to be replaced, as they were the Chinese ones from, my Jialing trail bike that I had replaced with stronger ones for use with the TSB ambulance sidecar, never did get changed until they had done 20,000 miles of the trip and all of Africa. 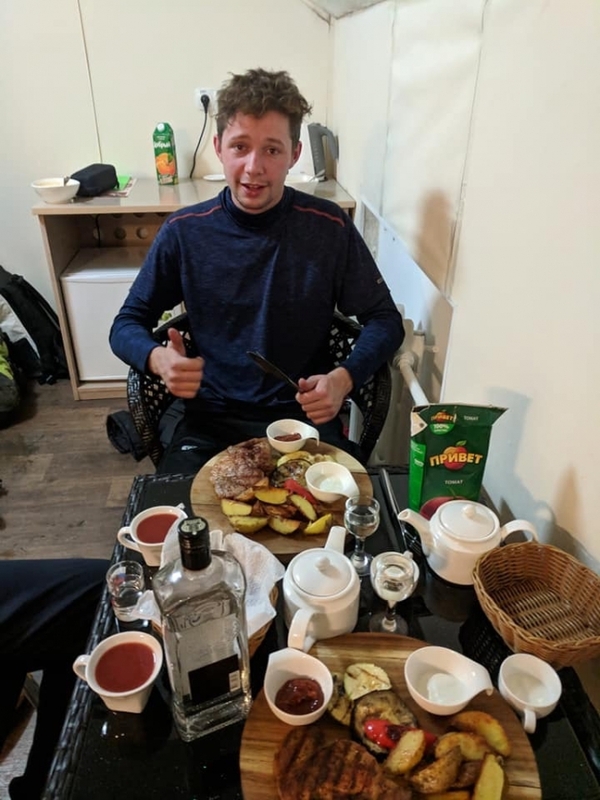 After an impromptu party last night, nursing what could have been a nasty hangover if not for the Russian drinking method Vodka, tomato juice, and then tea. Another couple of days getting further away from the equator and in a direction you don't want to go at this time of year. 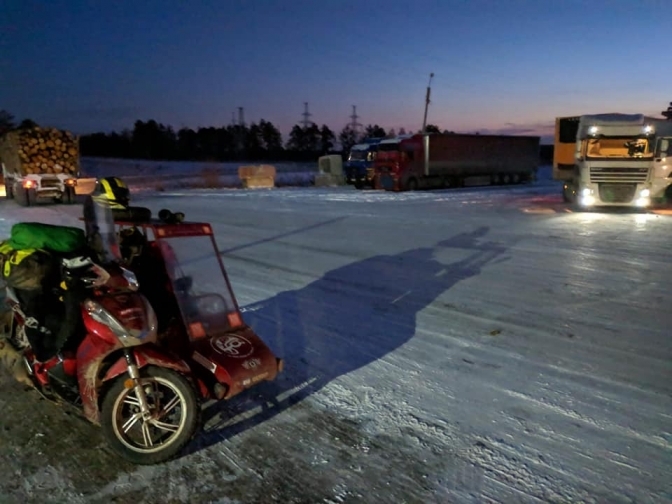 Will the cold get to much for them to travel, that is the big question..
Not good travelling for any vehicle ......but a Scooter and sidecar.......? 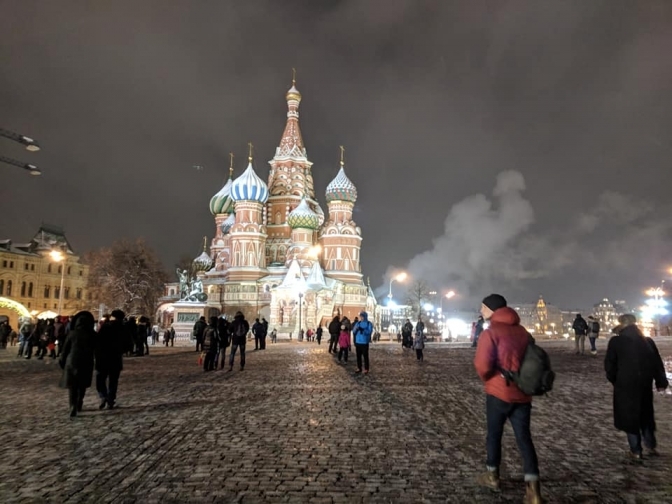 Over the past few days the chaps have made real progress on their run in Russia . 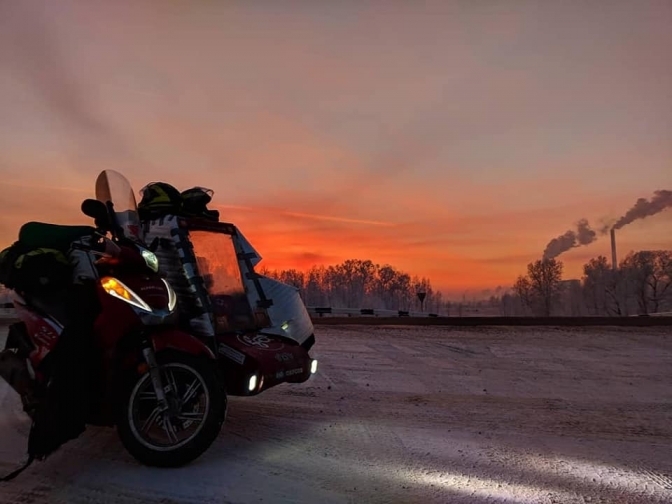 They have been sat on the top of China at minus 23 , but have now moved in a southerly direction for a while still at minus ten but they think they are in a heatwave.. 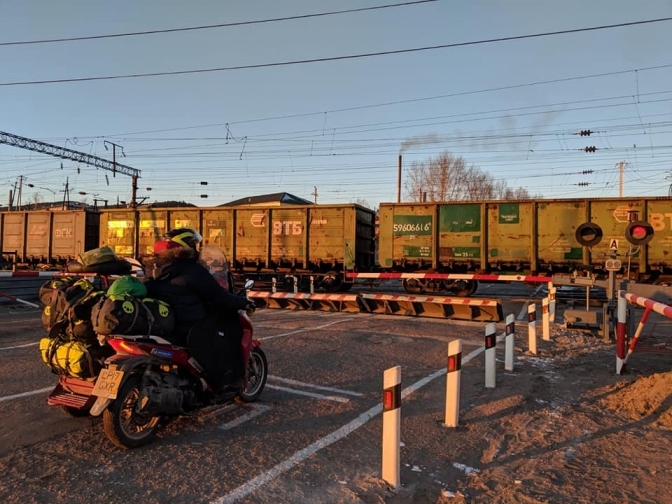 They yesterday passed through Chita and with good progress again today are midway to their next target city of Ulan Ude. 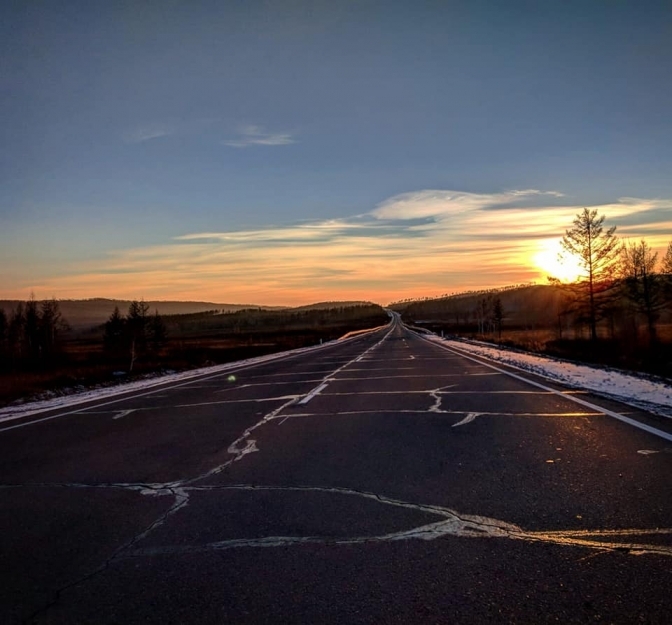 They then have to decide which route to take, carry on in Russia, or head south again into Mongolia, where the roads are said not to be has good. 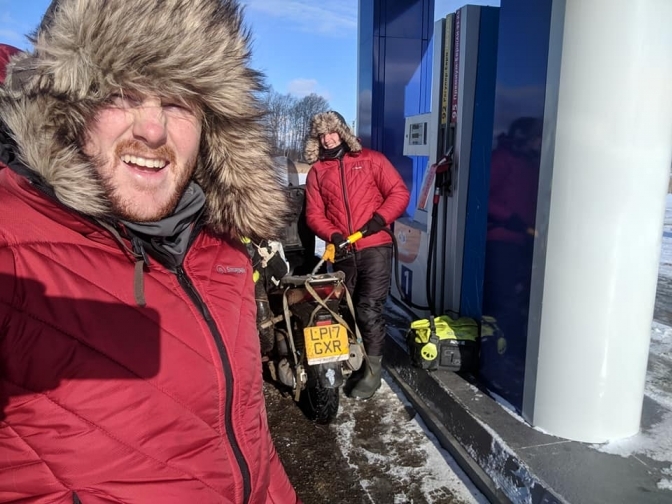 The chaps are still pressing ahead across Siberia. 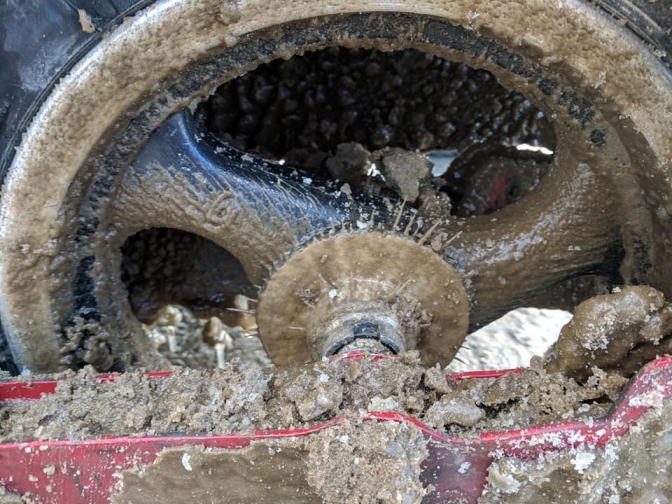 the temperature has now reached an all time low for them at minus 34... an oil seal around the starter motor spilt and deposited all the oil out. no oil not good, but two local garage owners, father and son, came to the rescue once again. And repaired the leak. for an early start today. An engine oil leak has been cured ,and snow chains manufactured and fitted by the same guy's, set the lads 60 k up the road before the chains finally snapped. But a good effort again from the two Russian mechanics. 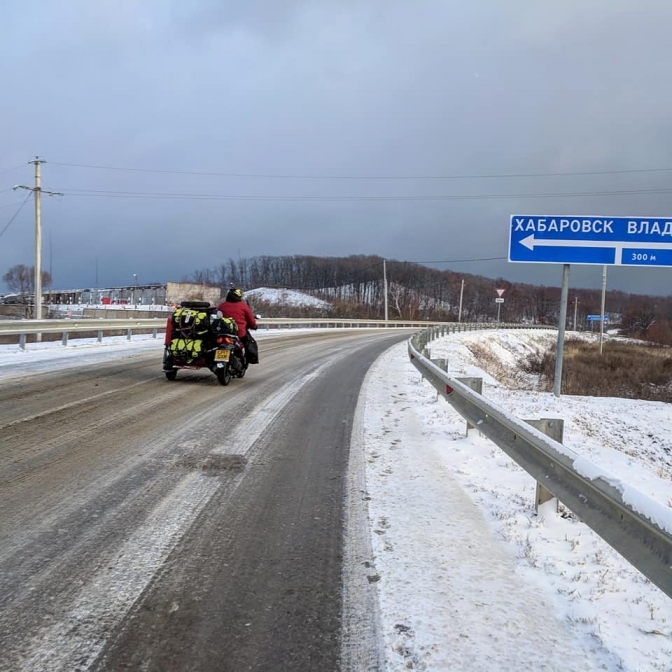 By Christmas Day the chaps had nearly finished their long haul through the cold of Russia, only to find how warm the real Russian people really are.. 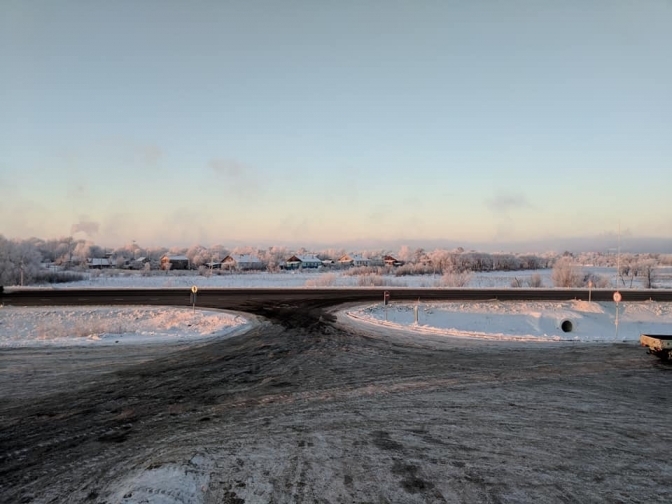 They had crossed the border into Estonia, and back into the EU,and spent the last day of the Old year and first of the New one, in the city of Tallinn. Back on the road today and heading towards the finish of this World First Challenge, ending at the Ace Cafe in London on the 19th of this month.